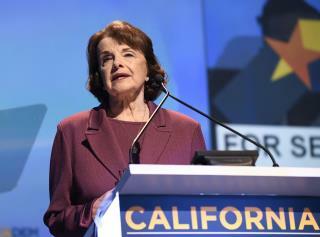 (Newser) – In what the San Jose Mercury News calls a "snub" and Politico calls a "sharp rebuke" for Sen. Dianne Feinstein, the California Democratic Party has declined to endorse her as she runs for a fifth full term. Feinstein's main opponent in the primary is State Senate leader Kevin de León, who won support from 54% of the delegates at this weekend's state party convention to Feinstein's 37%. Sixty percent of the votes are needed to secure an endorsement from the party. More damage to the democratic party by Obama. He gave every fringe left whack job a seat at the table and now they are taking over their party. I have only one thought for the California Democrats: Remember Joe Lieberman. This is the part where the left starts eating it's own tail. I've seen it before, several times, but it never gets old. Please pass the popcorn.